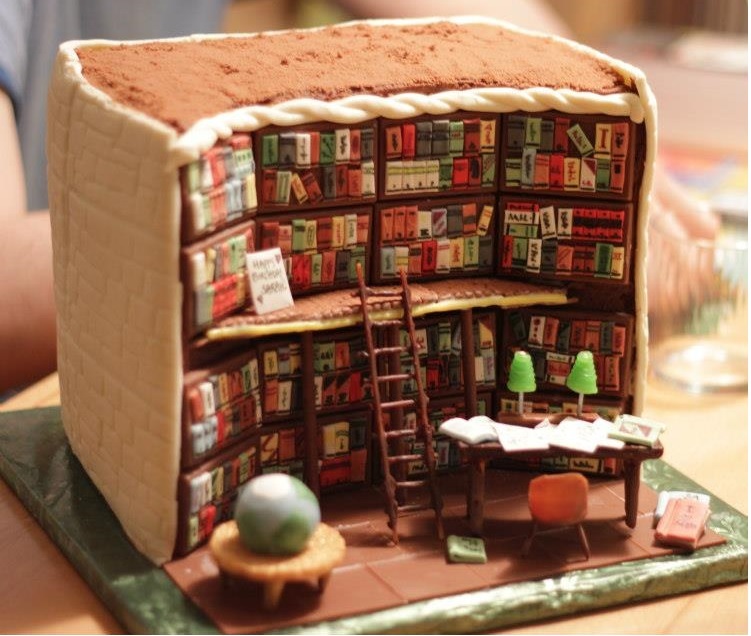 the Library Cake – Cakes. Books. Cooking. Life. It all started with this cake. A labor of love created for my daughter’s 21st birthday, it was presented to the recipient, admired, squealed over, photographed, and eaten. Then it was posted on Facebook for my friends, where it was liked, commented on, and eventually forgotten. Until Sonja Pöchhacker invited her fellow bakers to share their favorite works on her beautiful page, Zuckerbasteleien à la Sonja. I posted the library cake, Sonja shared it, and it apparently caught the Internet’s fancy. It started popping up on friends’ timelines, posted and shared from book-related pages in many different countries. From the book world it moved on to food blogging spheres, and then started showing up on art, style and living pages. At first I was mildly amused, then completely astonished. And delighted – it’s an amazing feeling to create something that seems to have touched people all over the globe, to know that my work has the power to make people smile, however briefly. One of the things I kept hearing was that I should create a page to share more of my cakes with a wider audience. So this blog was born. But since its namesake the Library Cake seems to appeal to more than just bakers and sugarcraft fans, this blog will also dabble in some of the other things I’m passionate about besides cakes: Good books, good cooking, the odd post about dollhouses or cats, and life in general. Who’s with me?